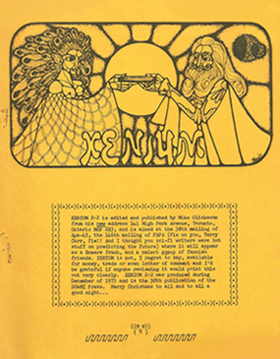 Published in Toronto, Ontario, Canada, Xenium was begun as an apazine for APA-45 by Mike Glicksohn and Susan Wood; as of issue four, which was constituted as "Volume 2", it was edited by Mike Glicksohn alone, and was distributed by Fantasy Amateur Press Association for a short period of time. It was subtitled "The Fanzine That Gives You Something Extra", and included small mementoes of Glicksohn's personal life, such as subway transfers, swizzle sticks, credit card slips, and so on. 15 issues were published between January 1973 and January 1990. Contributors of art work included Alicia Austin (Kevas and Trillium), George Barr, Barry Base, Randy Bathurst, Harry Bell (Grimwab), John Berry, Sheryl Birkhead,Tim Blackmore, Grant Canfield, Derek Carter, Vincent Di Fate, Connie Reich Faddis (Interphase), Mike Gilbert, C. Lee Healy, John Ingham, Tim Kirk, Vic Kostriken, Marty Larson, Barry Kent MacKay, Jim McLeod (Interplanetary Corn Chips), Randy Mohr, Paul Neary, Bill Rotsler, Stu Shiffman (Raffles), Jim Shull (The Essence), Dan Steffan (Boonfark), Angus Taylor, Arthur Thomson (The ATom Anthology), Bjo Trimble (Melange), Joan Hanke Woods, and others. Letters came from Robert Bloch, Eli Cohen (Kratophany), Don D'Ammassa (Mythologies), David Emerson (Rune), Jackie Franke (Resolution), Jerry Kaufman (The Spanish Inquisition), Robert Lichtman (Trap Door), Eric Lindsay (Gegenschein), Sam Long (Qwertyuiop), Mike O'Brien, Nigel Richardson, Peter Roberts (Checkpoint), Paul Skelton (Small Friendly Dog), Bob Tucker (Le Zombie), Harry Warner, Jr. (Horizons), Dave Yoder, and others. This page was last modified on 3 March 2019, at 18:14. This page has been accessed 24,222 times.